When Jon Stone, who would go on to co-create Sesame Street, left his job with Captain Kangaroo in 1963, it was to develop scripts with his writing partner Tom Whedon in hopes of selling a hit television show. In the summer of 1965, Stone and Whedon sold an idea to CBS for a half-hour Saturday morning show based on Snow White. CBS commissioned a script but then passed on producing the show. Stone and Whedon then went to ABC who liked the overall concept, but wanted them to change the story to Cinderella’s. That did the trick and pre-production was underway. The overall concept, remembered Stone thirty years later, was that, “…you’d tell a little of the Cinderella story, and end each week with something [happening] that couldn’t possibly happen if you knew the story” – like the prince accidentally crushing the glass slipper instead of finding it. The episode would end with a cliffhanger, picking up with a little more of the story’s action the following week. Once Cinderella’s exploits were exhausted, other fairytale characters would be integrated into the storyline. Stone and Whedon had seen the Muppets on The Tonight Show and other variety shows and knew Jim’s work. Stone called up Jim and arranged a meeting. “We hit it off right away,” Stone remembered, and Jim signed on to create the characters and perform in the show. The pilot was videotaped in black and white at the ABC studios in New York. 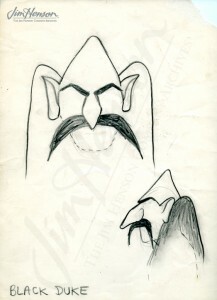 Bob Schwarz directed, and the characters designed by Jim, including the oversized Splurge, were performed by Jim, Frank Oz, Jerry Nelson, and a puppeteer from Ohio named George Latshaw. A young Harvard grad, Joe Raposo, provided the music, making this the first time he collaborated with Jim and Jon Stone. ABC passed on the series, but Jim kept the idea in mind as he tried to sell his ideas for television specials. In 1968, he made Hey Cinderella! which combined ideas from his collaboration with Stone and Whedon with those from his earlier work on Tales of the Tinkerdee. Jon Stone stayed involved, performing as one of the humans in the special, but was not a producer or writer on the show. 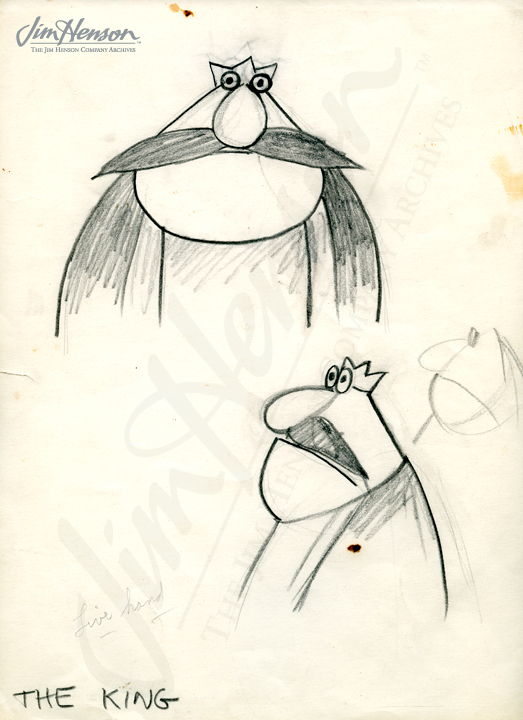 That year, Jon also collaborated on Jim’s NBC Experiment in Television Youth ’68, serving as director, and introduced Jim to the team developing Sesame Street. The King designed for Cinderella by Jim, 1965. The Black Duke designed for Cinderella by Jim, 1965. 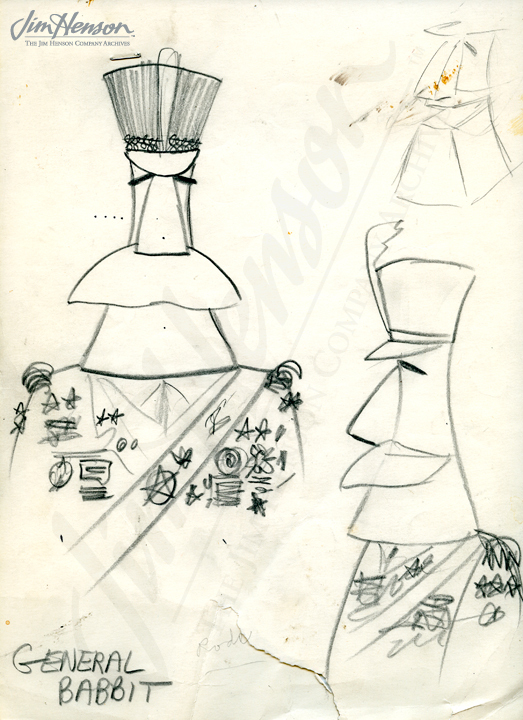 General Babbit designed for Cinderella by Jim, 1965. 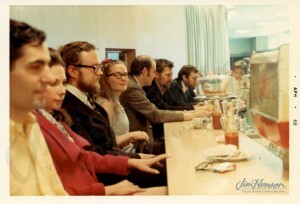 A quick bite during Youth ’68 production. The bearded men are, left to right, Jerry Juhl, Jon Stone, and Jim Henson, 1968. This entry was posted in 10-October '65, 1965, Hey Cinderella, Tales of The Tinkerdee and tagged Bob Schwarz, Cinderella, Frank Oz, George Latshaw, Jerry Nelson, Joe Raposo, Jon Stone, Splurge, Tom Wheadon. Bookmark the permalink.